This hand poured soy wax blend fills the room with the rich fragrance of the essential oil each letter inspires, burning for more than 60 hours. Packaged in a keepsake monogrammed box topped with a decorative crystal knob, each candle is monogramed on its surrounding glass as well and holds the unique scent of its individual letter. 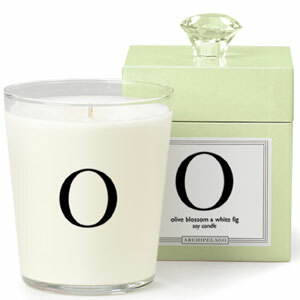 "O" is for Olive Blossom & White Fig in a sweet pastel green box; a subtle sweet scent. Ive purchased candles from all over the country, and this one is my favorite. Its clean burning,long-lasting and the fragrance is subtle, not too overwhelming. The presentation in the gift box is superb and Ive given this as a gift to many of my friends. Each friend gave it raving reviews. Even after the candle is gone, the gift box remains for other uses. I highly recommend this one!